Being raised in Vancouver, BC, Canada had a major advantage. There were families from all over the world and I had the opportunity to try many different cultures’ food. One of those was jerk chicken. Now I love jerk chicken but I also met people from other parts of the Caribbean. They also did grilled chicken but with different spice profiles. Not all had the allspice base of jerk chicken. 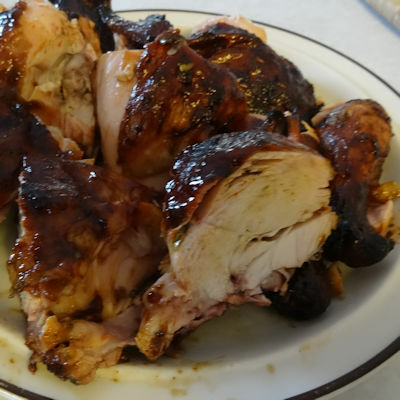 I wanted to try something different so I have made a smoked chicken dish based on my memories of those other Caribbean chicken dishes. Welcome to Island Chicken. Normally, chicken like this is done on a grill. However, I wanted to add more smoky flavour so I decided to use my Louisiana Grills Pellet Smoker. A pellet smoker lets you have great control over the heat easily. I decided to cook it low for 2 hours to get smoke flavour and then to increase the heat at the end to get the skin right. I started by mixing up a paste/rub/marinade to put on the chicken. I mixed the marinade ingredients in a bowl. Then I spatchcocked the chicken. This involves cutting down both sides of the spine with shears to remove it. Then you cut out the breast bone and the chicken will lie flat. I have done a video for Rosemary Chicken that shows how to spatchcock a chicken. If you don’t save the backbone and breast bone for stock, you are wasting food. Just saying. I rubbed some marinade onto the nonskin side of the chicken. I turned it over and carefully worked my finger under the skin of the breast halves and thighs. I put a spoonful of marinade under each of these areas of skin and rubbed it in. Then I rubbed marinade all over the skin. I put the bird in a large plastic bag and added any marinade that was left. It needs to stay in the bag for at least 8 hours. I let it sit in the fridge overnight. I made a basting sauce to sit overnight as well. I mixed the basting sauce ingredients together and put them in the fridge overnight to marry the flavours. The next day, I preheated the pellet grill to 200 F.
I should point out at this point that it just happened to take 2 hours to get to the internal temperature I was looking for. I smoked it until the internal temperature of the breast meat was 140 F.
After this smoking, I brushed the bird on both sides with brushing sauce and increased the temperature in the pellet grill to 325 F.
Every 15 minutes I brushed the bird with brushing sauce and cooked it until the internal temperature of the breast was 170 F.
If you do not have a smoker, you could cook this in a 350 F oven for about 2 hours, brushing with brushing sauce for the last 45 minutes. It won’t be as good as there won’t be smoky undertones. Make sure the internal temperature of the breast and thighs are over 165 F.
I let it rest 5 minutes and cut it into serving size pieces. This was amazing. The sweet savoury taste with a touch of heat . The smoke added a great complexity. 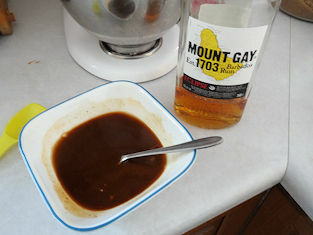 The rum notes were enhanced by the brown sugar and molasses. Delicious and complex. The only downside was the skin was just a touch too dark. Next time, I will turn the temperature up to 325 F when the internal temperature gets to 140 F but I won’t start brushing the sauce on until the internal temperature gets to 155 F.
Spatchcock the chicken by cutting out the spine and breast bone so it lies flat. Carefully work your finger under the skin at each breast half and thigh. Put a spoonful of marinade under the skin. Rub the marinade over all surfaces. 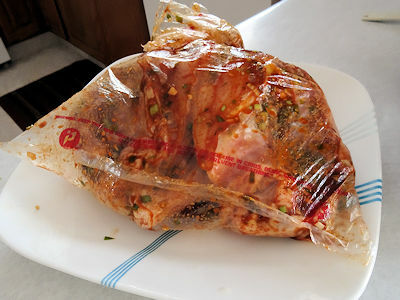 Put the chicken in a large plastic bag and add any remaining marinade. Let marinade 8 hour to overnight, turning occasionally. Mix all the brushing sauce ingredients and put in the fridge overnight. Preheat the smoker to 200 F.
Put the chicken in the smoker, skin side up, until the internal temperature of the breast is 140 F.
Increase the temperature of the smoker to 325 F.
When the internal temperature of the chicken gets to 155 F, brush with the brushing sauce on both sides of the chicken every 15 minutes. Continue until the internal temperature of the chicken breast is 170 F.
Let rest for 5 minutes and cut into serving size pieces. I’m going to try this on my gas grill over indirect heat, aftter I watch your video!! Looks delicious Thanks David! Thanks, Sam. I love spatchcocked chicken on the grill. I thing it cooks more evenly than a whole bird. Too bad the cook doesn’t! This looks absolutely delicious – I can imagine that it makes a big difference to marinate it overnight. Thank you so much. Yes, it just wouldn’t pick up the flavours with less marinating. This has to be one of the best looking chicken dishes I have seen in a long time! Yum! Thanks but I was thinking that about your Tex Mex Shredded chicken.